There are lots of things that affect how popular a mod becomes and how much coverage it gets. In fact, I had a conversation with somebody recently about his mod and I used the phrase “The right mod, in the right place at the right time”. A few days ago I posted a mod called The Sewer and it’s quite good in some sections and average in others. It’s clear that a lot of work went into it and I am surprised it hasn’t got more coverage, if for no other reasons than there’s not much around. It got me thinking about what affects popularity. The quick answer is “quality” but there have been some very good mods that get little coverage. Timing is also very important and it’s a subject I have written about before. There’s no obvious time to release something, besides NOT releasing just after a Valve game! In this article I am going to look at one particular aspect and I hope to write a few more on different topics soon. I should prefix the rest of this article by saying I am not criticising The Sewer directly. It was just the catalyst for the following thoughts. Let’s look at “Evenness of Quality. For a mod to be considered great it seems that it must have the same level of quality throughout. It can’t be “good” for most of it then, go to “average” and then onto “great”. People will remember the “great” and drop the “good” down to “average” and the “average” down to “poor”. Think about. How much can you actually remember from some mods? Probably only some parts. Of course, the longer the time since you played a particular mod, the more likely that most of it will blur. That’s an intrinsic issue with making mods – reusing what Valve gave us. In fact, that might be one of the marks of a good designer – the ability to reuse stuff in new and interesting ways, that don’t look out of place or seem strange. What is needed is a constant level of quality and preferably the higher that quality the better. But, let’s be clear. If you have a mod that goes between “good” and “great”, then don’t release it until everything is great. If your mod goes between “good” and “average”, the same applies. Bring those average areas up to good. It should go without saying but if you have a mod that varies between “poor” and “average”, you should be working hard to make everything average. Ideally, you want every area as good as possible but the real world is different. You might not have the ability (yet) or dedication to make great mods. Instead of spending time trying to make everything great, especially when it’s only average, you would be better off making the quality even, releasing it and starting on a new project. What I want as a player is consistancy, I don’t want ultra-detailed areas followed by empty streets. Detailed areas only highlight the empty ones. Yes, I know I have said that already but I reall want the point to sink in. Mappers can be a pretty stubborn lot, sometimes. Let’s talk about those two screenshots you just looked at. One from Research and Development, the other from The Sewer. Yes, it’s incredibly unfair to make direct comparison between two mods, made by two different people at different stages of their mod careers, showing two completely types of areas in different parts of a mod. But, (there’s always a but, isn’t there) these are the moments that we remember. These are the images that I think of when I think of the respective mods. In fact, let’s take that idea a little further. If you took the best and worst areas from each mod and compared them against each other there should be little difference. Taking into account the types of areas of course. On the same vain, and as a player, I don’t want to feel that I can spot maps or areas where the mapper hs improved. That recently happened with Precursor and it was quite noticable. Of course, there are many other things that are important but this is one I have noticed a lot recently. I’d love to hear from modders how they approach this when making maps and also from players who have noticed this in mods. Final words: Set realistic standards at the beginning of a project and KEEP them. Comics, films and level design have one important thing in common with painting: Composition. It’s about balance, showing the right amount of things at a precise time. Quality is really not about sheer numbers. A map will not automatically be better if you decide to make the 2D windows in the City 17 textures be actually three-dimensional. I think there are two main goals we have to worry about. 1) Consistency. Keeping a set of rules throughout a map or mod. If you go to certain lengths to add detail (for example the aforementioned 3D windows), you need to keep that level of detail because lack of it will be noticeable. It shows there isn’t a fixed criteria behind the levels (if they are made by one user) or a lack of real standards to which a group of mappers have committed themselves. 2) Keeping the player’s eyes busy. This means every area, no matter how small or big, needs a certain amount of elements to make the scene work. For example. A big conference room full of broken chairs and debris might have some bare walls, while the hallways leading to that room will probably need some paintings or other decorative elements (both can have both things of course!). 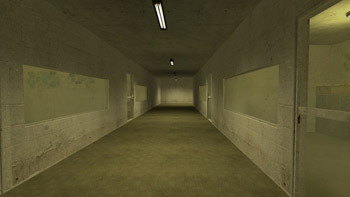 Something that also has to be mentioned is that even if a mod kept a consistently low level of detail (not many props, simple buildings etc), it can not work if the textures and actual props used are as detailed as they are (HL2’s texture set for example). In the days of HL1 and prefabs, this kind of consistency was easier to maintain than it is now. Agree with that Phillip, but what about the “topic” of the mod, isn’t that important too? 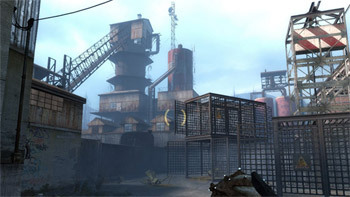 ?, I mean if we have a HL2 EP 2 mod that plays with the past as in Human Error or Black Mesa Fallback, and they even model new weapons and enemmys, I think that could affect the popularity of a mod indeed, like Research and Develpoment, it was so higly popular because you play only with the simply Gravity Gun, and that was a delight that almost everyone enjoyed on that case, I can conssider R&D as THE mod which closes the boundrys too much betwen HL2 and Portal styles, HL2 because of the exclusive use of the Gravity Gun and Portal Because the exclusive use of the ASHPD Portal Gun on it. Also I can mention the same on The Trap Mod, and Portal, the center of all on those jobs were the PUZZLES and how to slve them propperly. those clever topics help them so much on their poppularity. I know Portal is a Game itself and NOT a Mod but just referring to the mods I can conssider that a relevant and well guided TOPIC, is very important to it’s popularity. Agree with that Phillip, but what about the “topic” of the mod, isn’t that important too?? Yes, but this article is about just one aspect. I will write other articles about the others aspects later. I am not saying that quality is the only answer, just this one’s topic. Oh great then, yes there are many factors due to if a mod is ppopular or not indeed. For me, I spend far too much time perfecting an area, making it beautiful. This means the game never actually gets made. Well, you live and learn. You are most welcome. I look forward to playing your mod.